Ever wondered what it would be like to actually fly over Mars? I have – although I admit, I’m utterly entranced by that red world and the potentials it presents. Finnish film-maker Jan Fröjdman has as well – only he’s taken the idea a step further and produced a remarkable video, A Fictive Flight Above Real Mars. Last just over 4.5 minutes, the film takes us on a flight over some of the must remarkable scenery imaginable, using high-resolution images and data returned by NASA’s Mars Reconnaissance Orbiter (MRO). It’s a stunning piece showing many of the more intriguing features of Mars: the recent impact crater see in the still at the top of this article; the ice walls and melt holes of the Martian poles; gullies and cliffs rutted and marked by RSLs – recurring slope lineae – which might or might not be the result of liquid activity; the ripples of sand dunes, and the winding forms of channels which might have been shaped by the passage of water. To make the film, Fröjdman used 3-D anaglyph images from HiRISE (the High Resolution Science Imaging Experiment aboard MRO), which contain information about the topography of Mars surface. The work involved manually picking more than 33,000 reference points in the anaglyph images, and then processing the results through six pieces of software to achieve a sense of motion and panning across the surface of Mars. In putting the film together, Fröjdman wanted to create a real feeling of flying over Mars and of recapturing the feel of video footage shot by the Apollo astronauts as they orbited the Moon. To help with the latter, he overlaid the video with image cross-hairs of the kind seen in some of the Apollo footage, and added little bursts of thruster firings to simulate a vehicle manoeuvring in the thin atmosphere. The film concludes with a main engine firing, presumably to lift the vehicle back into orbit. And staying with Mars: NASA and SpaceX have started the process of selecting a landing site for SpaceX’s planned Red Dragon mission to Mars in 2020. The ambitious mission will see the company attempt to land a 10-tonne Red Dragon capsule on Mars purely by propulsive means. While paid for entirely by the company, the mission will feature a science suite provided by NASA. There are two major criteria governing any landing site location: scientific interest, and the potential for colonisation – the 2020 mission being the first of a number which SpaceX plans to uses as precursors for human missions to Mars. As such, it had initially been decided that any landing sites put forward must be near the equator, for solar power; near large quantities of ice, for water and at low elevation, for better thermal conditions. NASA initially identified four potential locations on Mars’ northern hemisphere which meet the broad criteria for the mission – but examination of three of them using the HiRISE system on the Mars Reconnaissance Orbiter showed they are rocky enough to pose a threat to landing a vehicle the size and mass of Red Dragon. This currently leaves a short-list of one, in the shape of Arcadia Planitia, a smooth plain containing fresh lava flows and which has a large region that was shaped by periglacial processes which suggest that ice is present just beneath the surface. However, negating this is the plain’s relatively high northern latitude (40-60 degrees north), which would reduce the amount of sunlight a base of operations there would receive in the winter months. 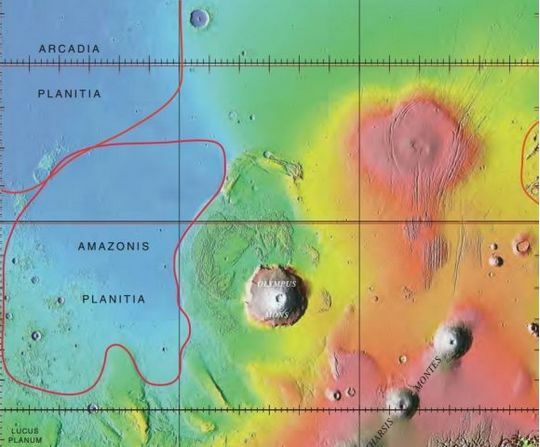 While Amazonis Planitia to the south offers a similar youthful surface, much of which is relatively smooth, it is largely volcanic in origin and unlikely to harbour sub-surface water ice which can be easily accessed. Given both of these point, it is likely other possible landing sites will be proposed in the coming months. It’s been a while since my last report on NASA’s Mars Science Laboratory rover, Curiosity. This is mostly being the updates coming out of JPL have slowed mightily in recent months. At present, Curiosity is examining sand dunes on the lower slopes of “Mount Sharp”. Once finished, it will proceed up higher to a feature known as “Vera Rubin Ridge”, inspecting a layer that is rich in the mineral hematite. From there, it will proceeded to even higher elevations to inspect layers that contain clays and sulphates. This will require a drive of some 6 km (3.7 mi) uphill, and so will require time to complete. A recurring area of concern for the mission – albeit not serious at this point – is the wear and tear on the rover’s wheels. In 2013, Curiosity suffered greater than expected damage to its six wheels while traversing some exceptionally rough terrain. 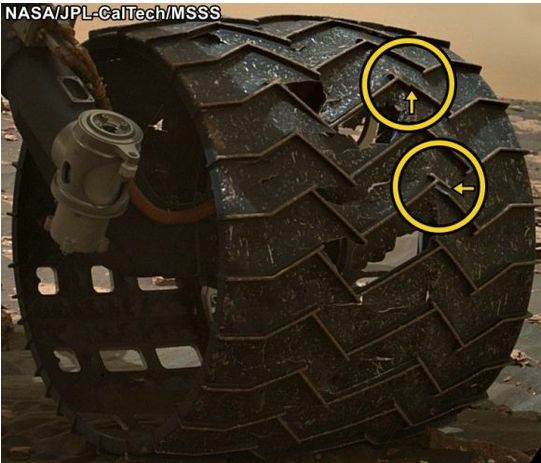 Although the damage was nowhere near severe enough to impeded the rover’s driving abilities, it did result in engineers keeping a much closer eye on the condition of Curiosity’s wheels using the imaging system mounted on the rover’s robot arm. The latest of these checks was performed on Sunday, March 19th, 2017, and it revealed two small breaks in the raised treads (“grousers”) on the rover’s left middle wheel. These seem to have occurred since the last wheel check at the end of January, 2017. These treads perform two major tasks: bearing the brunt of the rover’s weight and providing most of the traction for a wheel. Following the 2013 damage, testing on Earth suggested that significant breaks in three “grousers” on a wheel would indicate it has passed 60% of its expected lifespan. However, the mission team emphasise the rover has already driven more than 60% of the total distance needed for it to make it to all of its scientific destinations. As such, while the breaks will be monitored, they are not a cause for immediate or grave concern. Overall, confidence remains high that Curiosity will achieve all of its expected science goals and will likely make an extended traverse up the side of “Mount Sharp”. On Thursday, February 1st, 2017, NASA’s Juno spacecraft completed its fourth 53.5 day orbit of Jupiter since its arrival on July 4th, 2016. The vehicle, reached perijove – the point at which it is closest to Jupiter’s cloud tops at 12:57 GMT (07:57 EST), just 4,300 km (2,670 mi) above the cloud top at a velocity of about 208,000 km/h (129,300 mph) relative to the planet. 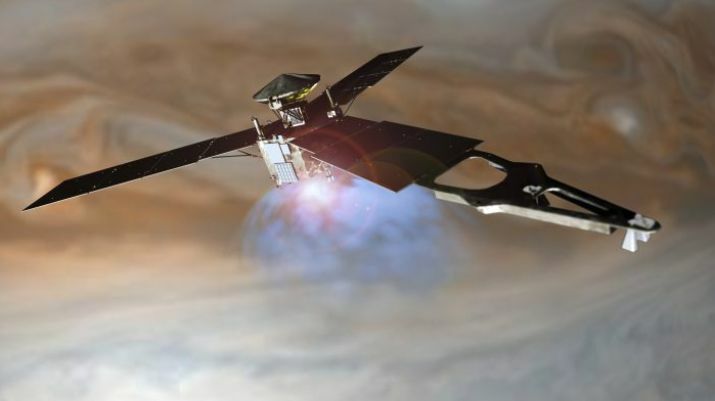 As there were no plans to utilise the craft’s main engine to slow the craft into a 14-day orbit around Jupiter – a issue with a potentially faulty set of valves in the motor system is still being investigated – the spacecraft was able to conduct a “close-up” data gathering exercise as it swept around Jupiter, gathering data on atmospheric radiation and plasma. Also active during the flyover was the spacecraft’s imaging system, dubbed “JunoCam”. This has already captured some stunning images of Jupiter during past perijoves, and the hope is it will have done so again. 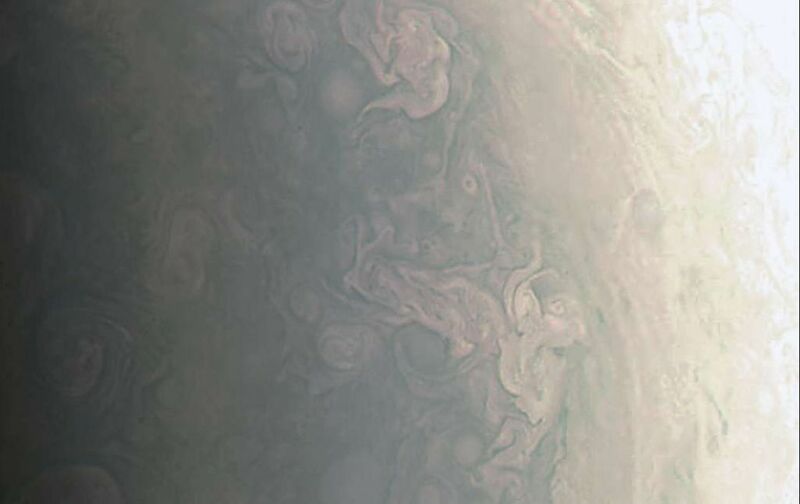 Thanks to an outreach programme in which NASA invite “citizen scientists” to download raw JunoCam images and process them at their leisure, together with a programme that allows the public to suggest areas the camera might image during each perijove, JunoCam has become extremely popular. The next close flyby will be on March 27th. It’s not clear yet whether this will be a science pass, or whether the Juno Mission team will risk firing the vehicle’s motor to slow it into the planned 14-day orbit. If they do, then the science suite will likely be powered down to conserve electrical power during the manoeuvre. 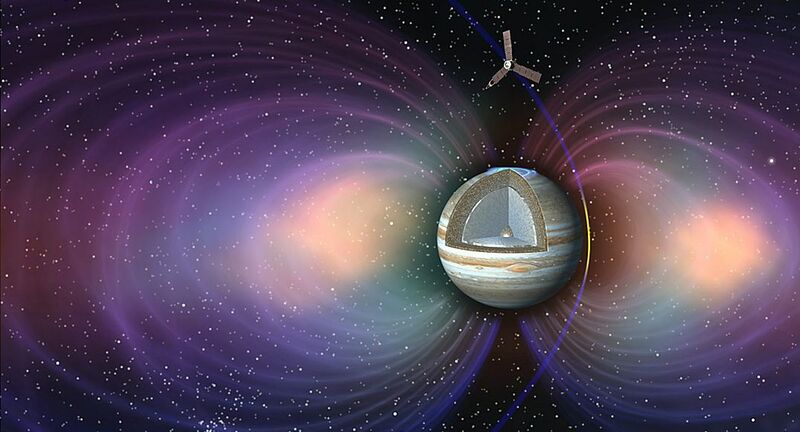 But even if Juno doesn’t achieve that final 14-day orbit, its science mission will not be unduly compromised. The craft will be able to meet all of its mission goals even if it remains in the 53.5-day polar orbit it currently occupies. The Jovian system is a place of intrigue. Not only is Jupiter a potential key to helping us understand the evolution of such gas giant planets, it sits at the centre of a gigantic magnetosphere so vast and powerful, it extends 5 million kilometres (3 million miles) towards the Sun, and reaches out as far as the orbit of Saturn – 651 million kilometres (407 million miles) – in the other direction. All of Jupiter’s Galilean moons, Callisto, Ganymede, Europa and Io, orbit within this magnetosphere, “bubble” and are affected by it. However, it is innermost Io which has the greatest interaction, and a proposal has been put forward to have Juno examine the relationship between Io and Jupiter in greater detail. With Jupiter on one side, and the other three big moons on the other, Io, roughly 320 km (200 mi) small in diameter than the Moon, is constantly being flexed by the opposing gravitational forces. This flexing physically manifests in the moon being the most volcanically active place in the solar system. At any given time, Io has an estimated 300 active volcanoes belching sulphur, sulphur dioxide gas and fragments of basaltic rock up into the space above itself to interact with Jupiter’s magnetosphere. As the material from the eruptions rise from Io, it is bombarded by high-energy electrons withing Jupiter’s magnetsphere. These ionise the ejected material, forming a vast plasma torus of highly energised (aka radioactive) particles around the Jupiter and straddling Io’s orbit. 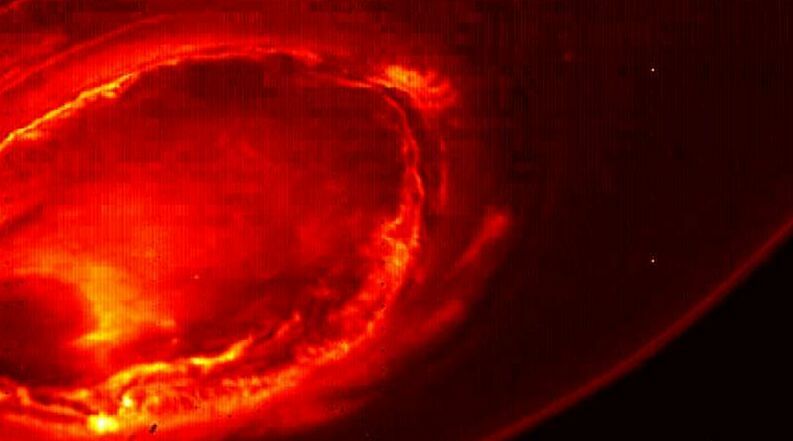 In addition, Jupiter’s magnetic field also couples Io’s polar atmosphere to the planet’s polar regions, pumping this ionised material through two “pipelines” to the magnetic poles and generating a powerful electric current known as the Io flux tube, which can most visibly be seen (if you are close enough) as Jupiter’s polar aurora. 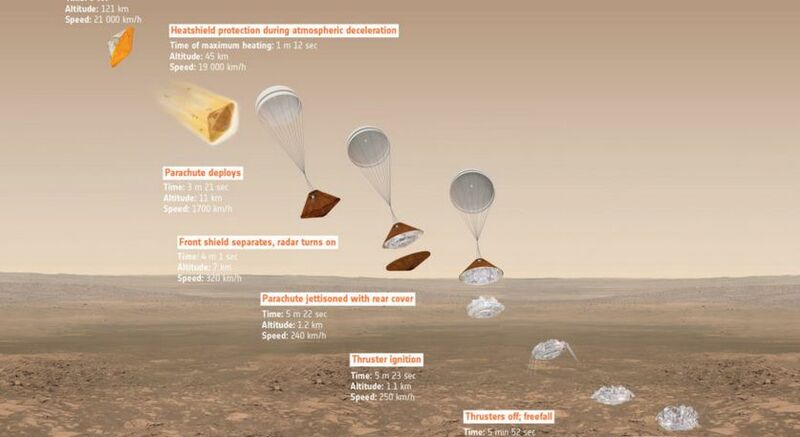 On Wednesday, October 19th, 2016, the European Space Agency (ESA) attempted, for them, a double first: placing a vehicle successfully in orbit around Mars (the Trace Gas Orbiter, or TGO) and landing a vehicle on the planet’s surface (the Schiaparelli demonstrator). 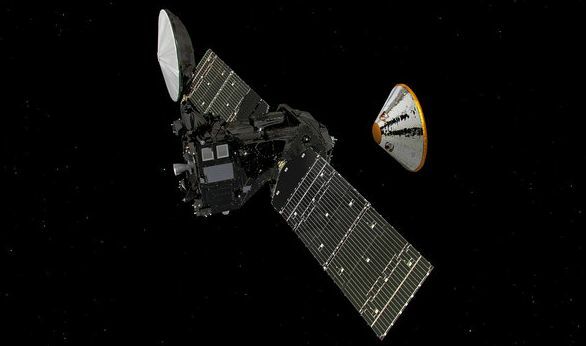 Launched in March 2016, TGO is the second European orbiter mission to Mars, the first being Mars Express, which has been operating around the red planet for 12 years. TGO’s mission is to perform detailed, remote observations of the Martian atmosphere, searching for evidence of gases which may be possible biological importance, such as methane and its degradation products. 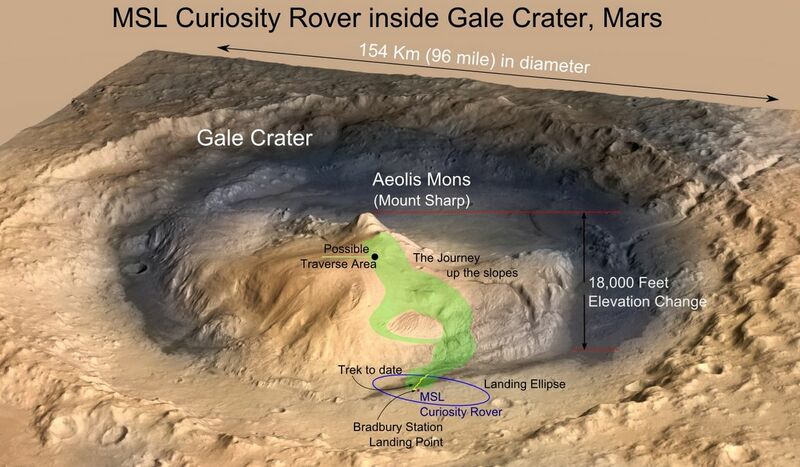 At the same time, it will to image Mars, and act as a communications for Europe’s planned 2020 Mar rover vehicle. TGO’s primary mission won’t actually start until late 2017. However, October 19th marked the point at which the vehicle entered its preliminary orbit around Mars. Orbital insertion was achieved following a 139-minute engine burn which slowed the vehicle sufficiently to place it in a highly elliptical, four-day orbit around Mars. Early next year, the spacecraft will begin shifting to its final science orbit, a circular path with an altitude of 400 km (250 mi), ready to start its main science mission. On Sunday, October 16th, prior to orbital insertion, TGO had bid farewell to the 2-metre diameter Schiaparelli Entry, Descent and Landing Demonstrator Module (EDM), which it had carried to Mars. The EDM was specifically designed to gather data on entry into, and passage through, the Martian atmosphere and test landing systems in preparation for ESA’s 2020 rover mission landing. Once separated from TGO, Schiaparelli travelled ahead of the orbiter, entering the Martian atmosphere at a speed of 21,000 km/h (13,000 mph; 5.8 km/s / 3.6 mi/s), at 14:42 UT on October 19th. After using the upper reaches of the Martian atmosphere to reduce much of its velocity, Schiaparelli should have proceeded to the surface of Mars using a mix of parachute and propulsive descent, ending with a short drop to the ground, cushioned by a crushable structure designed to deform and absorb the final touchdown impact. Initially, everything appeared to go according to plan. Data confirmed Schiaparelli had successfully entered the Martian atmosphere and dropped low enough for the parachute system to deploy. Then things went awry. Analysis of the telemetry suggests Schiaparelli prematurely separated from its parachute, entering a period of free fall before the descent motors fired very briefly, at too high an altitude and while the lander was moving too fast. Shortly after this, data was lost. While attempts were made to contact the EDM using ESA’s Mars Express and NASA’s Mars Reconnaissance Orbiter (MRO) it was not until October 20th that Schiaparelli’s fate became clear. Images taken by MRO of Schiaparelli’s landing zone revealed a new 15x40m (49x130ft) impact crater, together with a new bright object about 1 kilometre south of it. 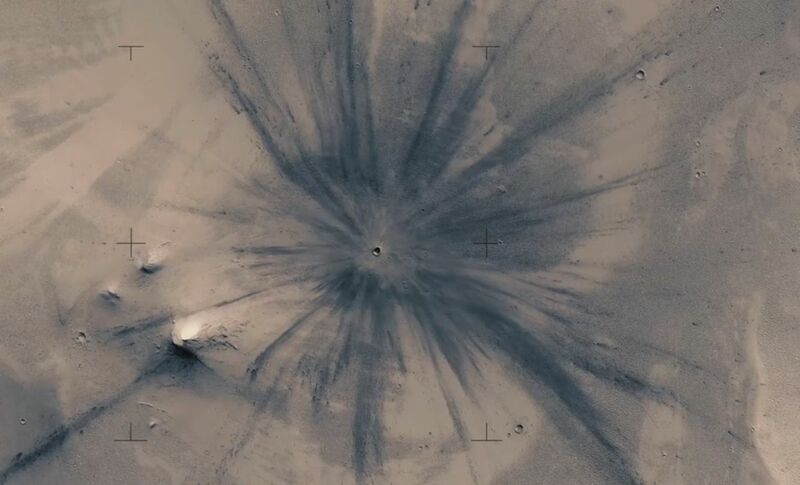 The crater is thought to be Schiaparelli’s impact point, and the latter the lander’s parachute and aeroshell. While the lander carried a small suite of science instruments which would have been used to monitor the environment around it for a few days following the landing, the major part of the mission was to gather data atmospheric entry and the use of parachute and propulsive descent capabilities. ESA believe this part of the mission to have been a success, even with minimal data gathered on the propulsive element of the descent. In the meantime, TGO is currently on a 101,000 km x 3691 km orbit (with respect to the centre of the planet). It is fully functional, and will undertake instrument calibration operations in November, prior to commencing the gentle aerobraking manoeuvres designed to reduce and circularise its orbit around Mars. On August 15th, I wrote about rumours that an “Earth-like” planet has been found orbiting our nearest stellar neighbour, Proxima Centauri, 4.25 light years away from our own Sun. 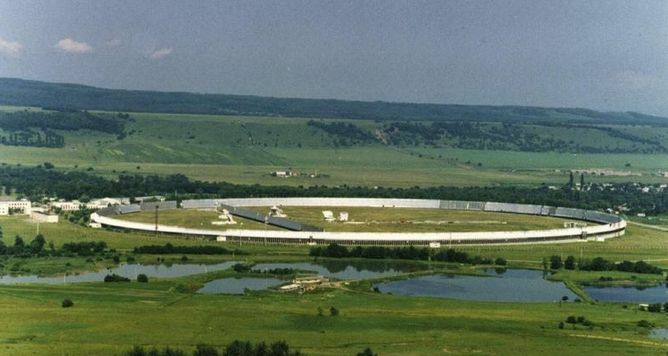 The news was first leaked by the German weekly magazine, Der Spiegel, which indicated the discovery had been made by a team at the European Southern Observatory’s (ESO) La Silla facility – although ESO refused to comment at the time. However, during a press conference held on August 24th, ESO did confirm the detection of a rocky planet orbiting Proxima Centauri. 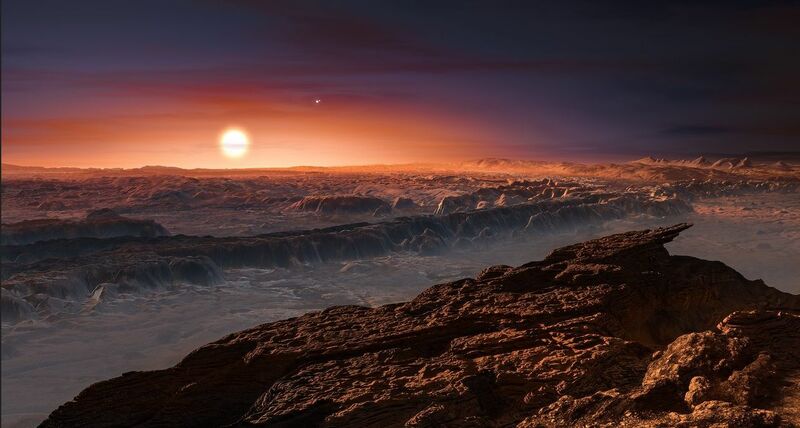 Dubbed Proxima b, the planet lies within the so-called “Goldilocks” habitable zone around its parent star – the orbit in which conditions are “just right” for the planet to harbour liquid water and offer the kind of conditions in which life might arise. The ESO data reveals that Proxima b is orbits its parent star at a distance of roughly 7.5 million km (4.7 million miles), at the edge of the habitable zone, and does so every 11.2 terrestrial days and is about 1.3 times as massive as the Earth. The discovery came about by comparing multiple observations of the star over extended periods using two instruments at La Silla to look for signs of the star “wobbling” in its own spin as a result of planetary gravitational influences. Once identified, ESO called on other observatories around the world to carry out similar observations / comparisons to confirm their findings. Although the planet lies within the “Goldilocks zone”, just how habitable is it likely to be is still open to question. Stars like Proxima Centauri, which is roughly one-seventh the diameter of our Sun, or just 1.5 times bigger than Jupiter, are volatile in nature, all activity within them entirely convective in nature, giving rise to massive stellar flares. As Proxima-B orbits so close to the star, it is entirely possible that over the aeons, such violent outbursts from Proxima Centauri have stripped away the planet’s atmosphere. In addition, the preliminary data from ESO suggests the planet is either tidally locked to Proxima Centauri, or may have a 3:2 orbital resonance (i.e. three rotations for every two orbits) – either of which could make it an inhospitable place for life to gain a toe-hold. The first would leave one side in perpetual daylight and the other in perpetual night, while the second would limit any liquid water on the surface to the tropical zones. Nevertheless, the discovery of another world in one part of our stellar backyard does raise the question of what NASA’s upcoming TESS mission might find when it starts searching the hundreds of nearby stars for evidence of exoplanets in 2018. NASA’s Juno space craft made a second successful close sweep over the cloud-tops of Jupiter on Saturday, August 27th to complete its first full orbit around the planet. Speeding over the planet at a velocity of 208,000 km/h (130,000 mph) relative to Jupiter, Juno passed just 2,400 km (2,600 miles) above the cloud tops before heading back out into space, where it will again slowly decelerate under the influence of Jupiter’s immense gravity over the next 27 days, before it once again swing back towards the gas giant. “Early post-flyby telemetry indicates that everything worked as planned and Juno is firing on all cylinders,” said Rick Nybakken, Juno project manager at NASA’s Jet Propulsion Laboratory, as telemetry on the flyby started being received on Earth some 48 mins after the flyby, which occurred at 13:44 UTC. All of Juno’s science suite was in operation during the passage over Jupiter’s clouds. However, due to speed at which the gathered data can be returned to Earth, and given it cannot all be relayed in one go or necessarily continuously, it will be a week or more before everything has been transmitted back to Earth. Nevertheless the science team are already excited by the flyby. 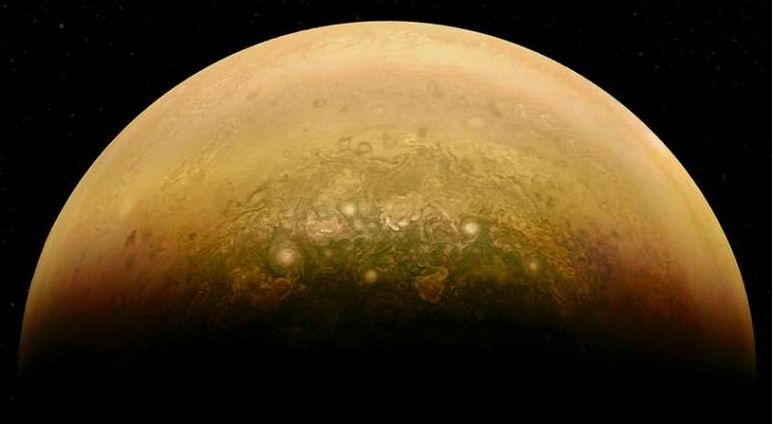 “We are getting some intriguing early data returns as we speak,” Scott Bolton, principal investigator of Juno from the Southwest Research Institute, stated. Some of that data included initial images of Jupiter captured as Juno swept towards the planet during the run-up to periapsis. “We are in an orbit nobody has ever been in before, and these images give us a whole new perspective on this gas-giant world,” Bolton added. NASA’s Juno mission to Jupiter is swinging back in towards the gas giant, on route to complete the first of some 37 planned polar orbits of the planet between now and February 2018 which are designed to probe the mysteries of the giant planet as never before. As I reported in early July, the Juno space vehicle arrived at Jupiter on July 4th, where it completed a critical burn of its UK-built Leros-1b engine to ease its way into a highly elliptical orbit around Jupiter after a voyage of 2.8 billion km (1.74 billion miles) and 5 years, during which the craft first looped out past the orbit of Mars before falling back towards Earth to pick up a “gravity assist” to accelerate it on to its rendezvous with Jupiter. The July 4th braking manoeuvre placed Juno in an orbit which, at its closest to Jupiter, skims just a few thousand kilometres above the planet’s cloud tops, and at its furthest sees Juno over 3 million kilometres from the planet. That first braking manoeuvre was undertaken with the probe’s science systems powered-down as a precautionary measure, and were powered-back up a few days after closest approach. On August 27th, the vehicle will complete the first of these 53.5-day during “long” orbits, once again passing to within 4,200 km (2,600 mi) of Jupiter’s cloud tops at the equator, after arcing down over the planet’s north pole – and this time, all of the science instruments will remain operational, including JunoCam, the vehicle’s imaging system. 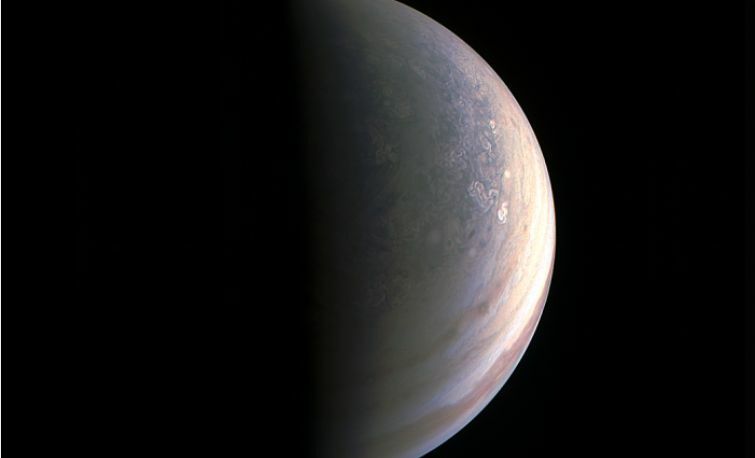 JunoCam has actually be in continuous operation in ” marble movie” mode since July 11th, 2016, capturing 5 full-colour images per hour, watching Jupiter spin from a distance (a sample of this movie is embedded blow – not Jupiter’s spin is greatly speeded-up). However, Jupiter is so small in most of the images – just 50 pixels across – that these haven’t been a source of interest to the media. As Juno approaches Jupiter on August 27th, however, the imaging system will switch from “marble movie” mode to gathering images at a higher rate to fully capture the close flyby as the craft passes over Jupiter’s north pole, curls around the planet north-to-south, before heading back out into space once more on the second of its “long” orbits. 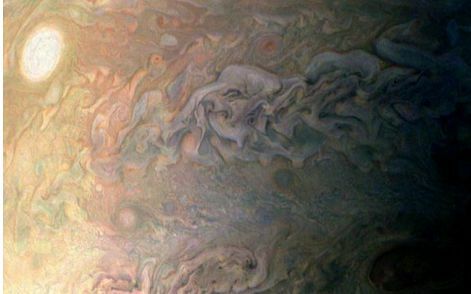 JunoCam has a relative narrow field of view, so the images it captures on August 27th will be tightly focus on Jupiter’s clouds, and not as panoramic as those we’re been accustomed to seeing from the Hubble Space Telescope and from the now defunct Galileo mission. But they should still hopefully prove spectacular. 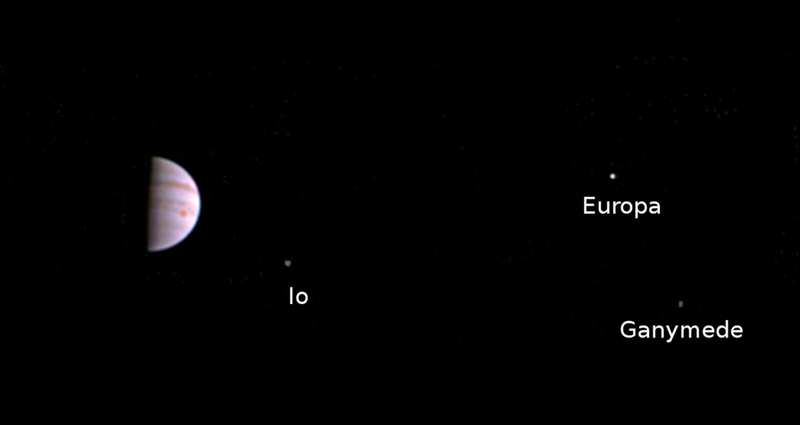 The next time Juno makes a close approach to Jupiter after this will be on October 19th. At that time, the science instruments will again be powered-off while the craft makes a second orbital burn, this time to reduce its orbit around Jupiter of 53.5 days to just 14 days, allowing the primary science mission to start. 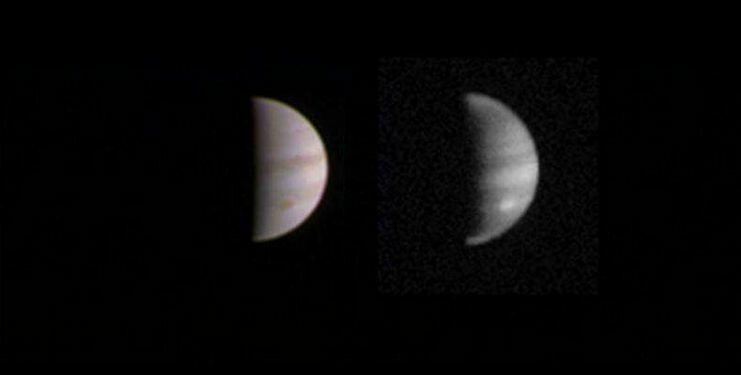 This is intended to improve our understanding of Jupiter’s formation and evolution. The spacecraft will investigate the planet’s origins, interior structure, deep atmosphere and magnetosphere. Juno’s study of Jupiter will help us to understand the history of our own solar system and provide new insight into how planetary systems form and develop in our galaxy and beyond. It will also, for the first time, allow us to “see” below Jupiter’s dense clouds. This past week, NASA hosted a Journey to Mars showcase, looking at the space agency’s plans for developing the means to send humans to Mars in the 2030s. The actual plans for doing so are still pretty nebulous, but much of in revolves around the current development of the Orion Multi-Purpose Crew Vehicle (MPCV) and its supporting systems (including deep-space habitat modules), and the rocket system which will be used to launch it, the Space Launch System (SLS). This being the case, the event was hosted at NASA’s Michoud Assembly Facility in New Orleans, where the core stage of the SLS vehicle the Orion MPCV. Included in the event was a trip to see a further test firing of one of the RD25 engines which will power the SLS at launch, and were previously used to power the space shuttle during its ascent to orbit. However, what particularly grabbed the attention of the media was the announcement that the space agency is looking to sell the International Space Station to a private entity or entities in the mid-2020s, under the understanding that said entity/ies will keep the station active and continue to allow NASA to have access to it. The move is a bold one. Currently, the ISS is the biggest single component of NASA’s budget, (just over US $3 billion in 2016 and projected to pass US $4 billion in 2020), and is only funded through until 2024. Thus, selling it to a private concern, could allow NASA to continue to make use of the station for research purposes beyond 2024 without having to meet all of the hefty costs involved in actually operating the station, potentially freeing-up some of the money dedicated for ISS support for use elsewhere. Quite who would be willing to buy the ISS – both SpaceX and Boeing are apparently on NASA’s list of potential interested parties, although the interest may not be reciprocal – and quite how NASA’s international partners feel about the idea, is unclear.